Pennsylvania Railroad GG-1 Electric Locomotive, PRR 4890; photo by Thomas Merton on Flickr (noncommercial use permitted with attribution / share alike). 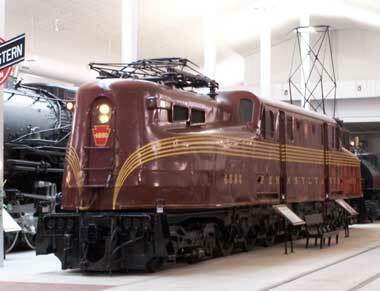 Quote from website of PA state Representative Lynn Herman: "The GGI 4859 electric locomotive is one of 138 sleek and shiny bullets that smoked the rails at speeds above 100 miles per hour. Built in 1937, the GGI 4859 pulled troop trains to military destinations during World War II and continued powering coal and passenger cars until retirement in 1979."